These days’ celebrities getting trolled for their fashion sense or for the comments that they make are a common scenario. The recent one to get caught in this troll net is actor Disha Patani. Disha Patani, who rose to fame with her first movie Dhoni, the untold story, continued her success story with Baaghi 2 starring opposite Tiger Shroff. 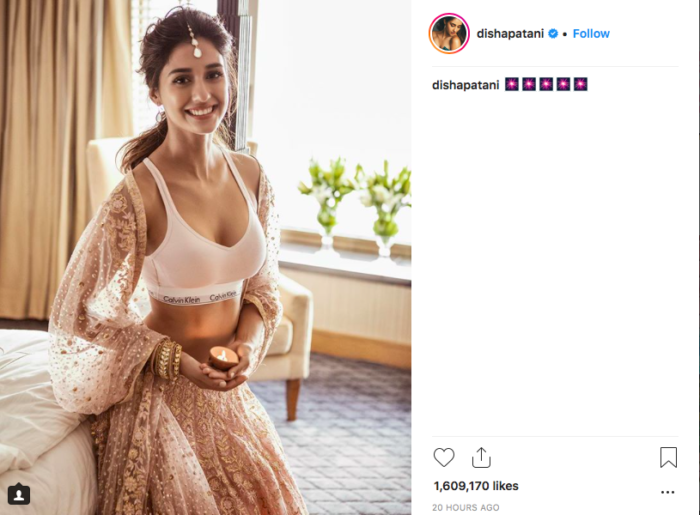 Disha, who endorses Calvin Klein as a brand, posted a pic on Instagram to wish Diwali to her fans. In the pic, she was seen sporting a CK sports bra with a traditional lehenga and dupatta. While likes started pouring in for the picture, it did not go down too well with some of the fans and the trolling started. People accused her of playing with the Indian sentiments and exposing too much in traditional attire. This is not the first time that Disha has been trolled for exposing, earlier also she had posted some pics from a shoot and was condemned by people for her bold dressing. This time also negative comments flooded her Instagram account and hardly a couple of fans defended her right to decide for herself. So what do you think Disha do to tackle the trolls, well no, she did not remove her picture. She has rather turned off the commenting option on her picture and also deleted all the previous comments. Disha who is busy shooting with Salman Khan for Ali Zafar’s Bharat, did actually well. Rather than confronting the audience, she simply muted her trolling fans. On the work front, Disha is just 3 films old and has carved a place for herself in Bollywood. In her next film Bharat, she plays will play Radha, a trapeze artiste in a 1960s circus. The movie also stars Katrina Kaif, Sunil Grover and Tabu and will hit the theatres on EID 2019.